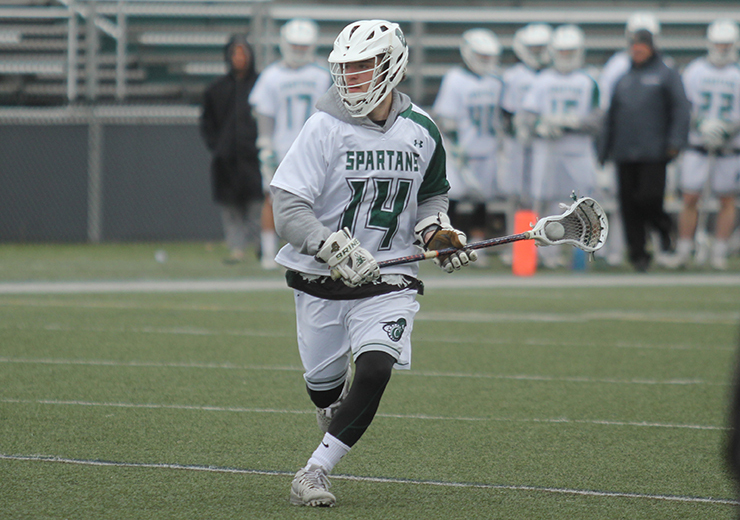 Castleton men’s lacrosse has experienced a shaky start to their 2019 campaign. Since beginning the season on March 9, the Spartans find themselves sitting at 1-3. During this four-game span, Castleton defeated SUNY Canton a resounding 18-8, but fell to Kean, Potsdam, and most recently, Utica. Despite sitting at 1-2 entering the contest with Utica, some remained hopeful. “I’m thinking we can have a battle if we stay disciplined and play our game,” said junior attackman Tyler Crowningshield. And a battle it was. Crowningshield and senior midfielder Jason Sedell each netted a pair of goals early on and the Spartans entered the second half tied with the Pioneers 6-6, looking ready to follow through on this proclamation. However, Utica came out too hot for the Spartans to handle in the second half, and ultimately the game got away from them. Castleton was outscored 8-1 in the final two quarters of the game, leaving the final score at a disappointing 13-6. Defense has been an issue so far this season. In their three losses, the Spartans have been outscored an average of seven goals per game and have yet to allow fewer than eight goals in any matchup. Yet, some are undeterred by this recent skid. From a number’s standpoint, things might look dim, but it is just one week into the season. Luckily for the Spartans, they have not had any conference matchups yet and their three losses technically count as exhibitions. In other words, it is not too late to turn things around. “A true warrior learns from his mistakes and prepares to conquer the next battle,” Crowningshield said. The Spartans will retake the field on Tuesday March 21 at home against Plattsburgh.